Located just off of Route 23 north of Columbus OH (about 10 miles north of I-270) and just south of Delaware OH (about a mile south of where 315 intersects 23). Virtually every Friday evening (except holidays) during the year a public program is held in which the CAS plays an integral part. If you enjoy sharing views through a telescope with visitors then you want to volunteer during these public programs. After the program and after the public has left you can then enjoy some private observing time in the pristine settings of a classic observatory. 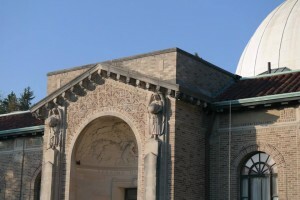 On the second Saturday of every month Perkins Observatory hosts the CAS club meeting. This is the best time to get to know the place, meet club members,and bring your telescope for some more serious observing (when clear). 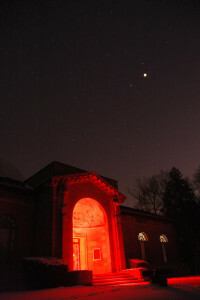 The dark sky conditions at Perkins Observatory are far from perfect. But at the same time they are a lot better than you can find any place inside the Columbus area and it is easy to reach. On the best of nights you can spot the Milky Way in Cygnus. This location is not considered a dark sky site but because of the proximity and intriguing nature of the building itself it is a great place to observe. It must be noted that overnight observing is NOT permitted at the site. Society member Bill Burton shows a guest the moon. 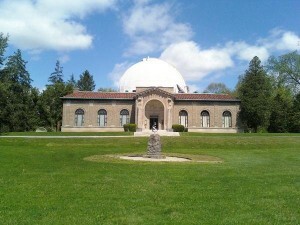 CAS members are encouraged to volunteer during the public nights at Perkins Observatory. To volunteer just show up about an hour earlier than the scheduled start of the program. If you are new be sure to introduce yourself to others right away as a new CAS member. You do not have to bring a telescope however it is recommended. Volunteering provides you with a great opportunity to learn how to use different telescopes and find new things in the sky. To join the volunteer group contact Bill Hurley at one of our meetings. We are the guests of Perkins Observatory and that is something that must be remembered at all times. When volunteering for public programs be polite and ready to help. Many of the visitors to the programs are looking through a telescope for the first time and they will require your help. Remember to clean up after yourself and leave the site better looking than when you came.